This month I am taking a Leave No Trace Trainer (LNT) course to be trained on teaching the LNT principles and other land ethic issues, which should be great. Below is a LNT Youtube video I found; enjoy! lnt.org explains why to leave no trace, “The Leave No Trace concept is one that crosses all boundaries of the recreation spectrum and is applicable for anyone who enjoys spending time in the out-of-doors. The idea is simple – leave the places you enjoy as good or better than you found them… both skills and ethics [are] involved, as well as good decision-making. We believe that if people do something, even something simple, to help take care of the recreational resources they cherish, we will all benefit. Cleaner water, less campfire impacts, fewer negative encounters with wildlife, less damage/loss of cultural and historic artifacts are just a few of the benefits of adhering to Leave No Trace. Through the next of the couple of the months I want share each principle and talk about why its important. If we do our part keeping the land as good or better than we found it, our children may enjoy it in the future. 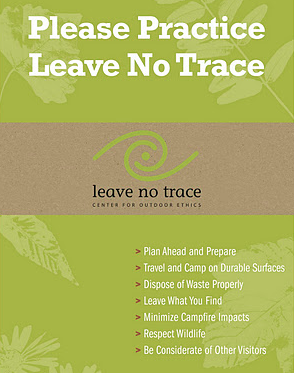 Below is a 10 min video introducing leave no trace, produced by the National Park Service. I would love to hear your thoughts on why you go outdoors and why it is important to keep these areas pristine. Feel free to comment below your thoughts about LNT and land ethics.